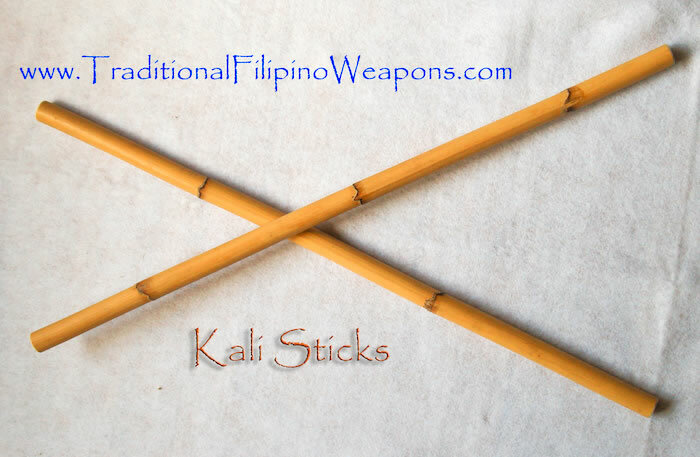 All Kali/Arnis, Eskrima sticks are made of hard Indonesian Rattan which is considerably harder than Filipino Rattan! Kali, Arnis, Eskrima Sticks – These hard rattan sticks are well known to break apart other peoples sticks due to the durability of Indonesian Rattan. We also offer an Oiled stick, which has even more durability. Sticks come in two lengths: 28 inches long and 24 inches long, and are approximately 3/4’s to 1 inch in diameter. The 24 inch sticks generally have two nodes and the 28 inch sticks have 3 or 4 nodes. The prices are for a set of two sticks. These sticks are made from Indonesian rattan. This particular rattan is considerably more durable than Filipino rattan and slightly heavier, as well. TFW rattan sticks are known to break apart other practitioners’ Filipino rattan sticks during hard training drills. Note that we do not burn our sticks. Taking a blow torch to rattan is NOT a fire hardening technique. That is a myth. Burning rattan only makes it brittle. We are confident that you will be very happy with these sticks. Diameters vary between 7/8’s to approximately 1 and one eighth inch. Use the TFW rattan sticks and watch everyone else s sticks from other companies break apart. The TFW Rattan Sticks are all sold in pairs.